The Incredible Lightness of White…..
After last week’s wintry, pristine snowfall I guess I’ve got WHITE on the brain. Although I cherished every moment of the relaxing “forced vacation”; reading screaming children, baking 40 loads of laundry, crackling fire a freaking huge mess in every corner of the house I’m happy to see the last of the fluffy stuff melt into the ground as we all know in the end its really just a big fat PITA and relieve the thirsty winter grass. Plus I’m painstakingly aching for any glimmer of evidence that spring is around the corner….a sprig? … a bud? ….anything? anything???….. but until the pansies bloom, the current snowstorm has left me obsessing about snow white interiors. twisted perhaps, but I thought quite funny??? 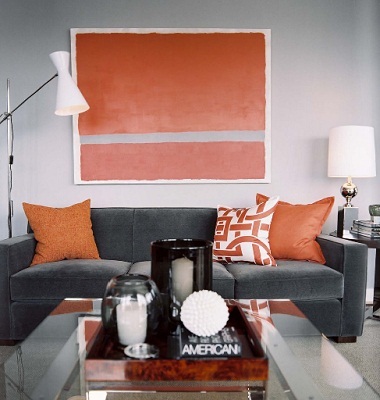 ok… back to interiors… A monochromatic palette is truly my design eye’s happy place. It’s peaceful, it’s fresh, a beautiful canvas of purity. Many of my clients admire it as well but seem to be afraid of it — and surprisingly not from the practical standpoint of how easy it would be to dirty it — but more from fear they’ll end up with a surgical suite in lieu of a living room. Be not afraid! Here are user friendly tips — avec images magnifique — to inspire us how to live beautifully in a world of white. First and Foremost ….one must realize that all whites are not created equal. Whites fall into two camps: Warm (those with yellow or red undertones) and cool (with blue or black undertones). The warm whites instill comfort and the cooler are best for crisp, ultra modern, minimalist spaces. Use caution when mixing the two in the same room as the warmer white will start to look dingy in contrast to its sharper blue – toned counterpart. 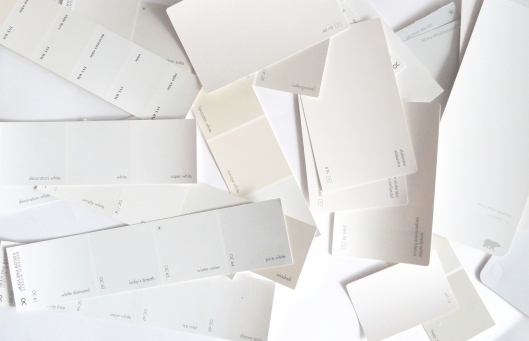 To distinguish a “warm” from a “cool”: white, compare paint chips under natural light lying atop a piece of quality bright white copy paper ; the underlying tones will be apparent. 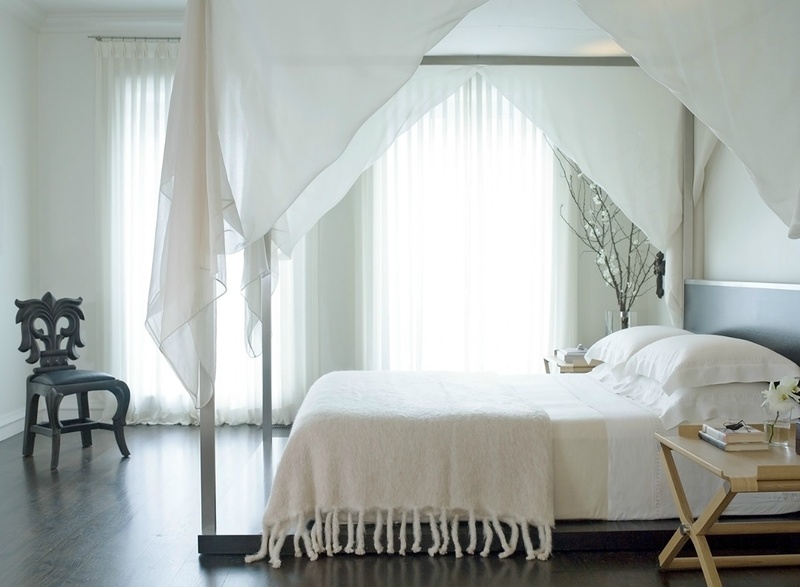 When combining several shades of white in a single room, try varying sheens, (flat, matte, semi-gloss). It might seem in significant but those slight discrepancies will reflect light differently and create interest in the monochromatic room. Vary textures to ward off any chill. In my own designs I generally prefer warm whites to cool and I achieve this feel by integrating a variety of fabrics and finishes. Linen in all shades of light (from white to cream to beige) is one of my all time favorite looks…. and introducing organic elements into the space is a design MUST for softening the edge and breathing life into the a neutral space. 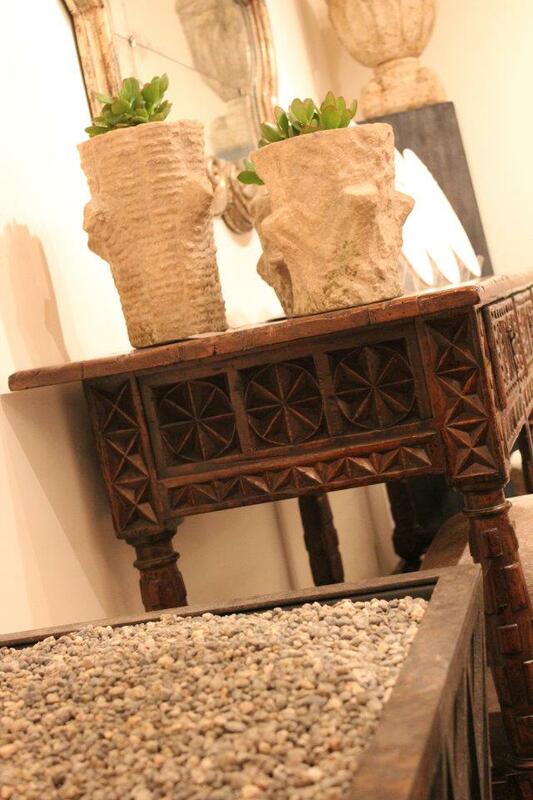 Examples; stone planters, driftwood accents, plants, a hand carved side table — all of the above will really transform the room into something special. Axel Vervoordt, grand seigneur of the design world, has perfected the art of integrating organic materials into his always neutral design schematics. Just breathtaking! The natural touches create interest, add dimension and really soften the space. 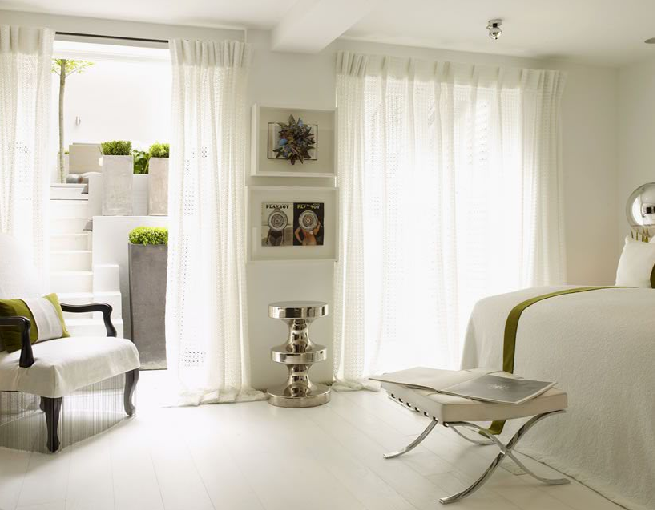 Design godess Kelly Hoppen brings in "organic" elements with greenery and stone planters. 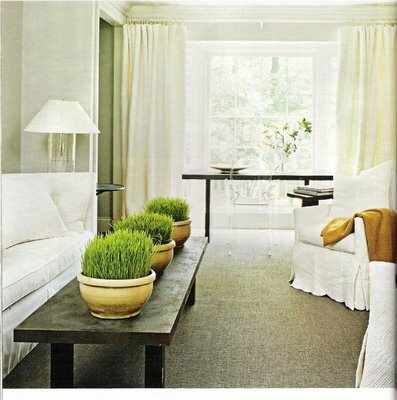 Love the reclaimed wood coffee table and the zen symmetry of the 3 potted grass planters. White can expand a space. In a world of white you’re not as conscious of walls and boundaries — a room that might otherwise seem small feels bigger and much more modern. 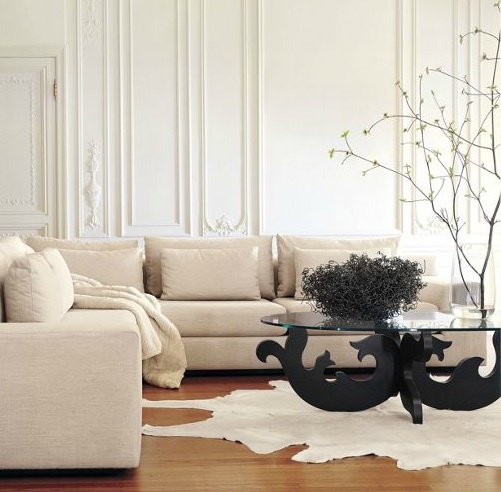 I adore pale rooms where select pieces of furniture standout like sculpture. 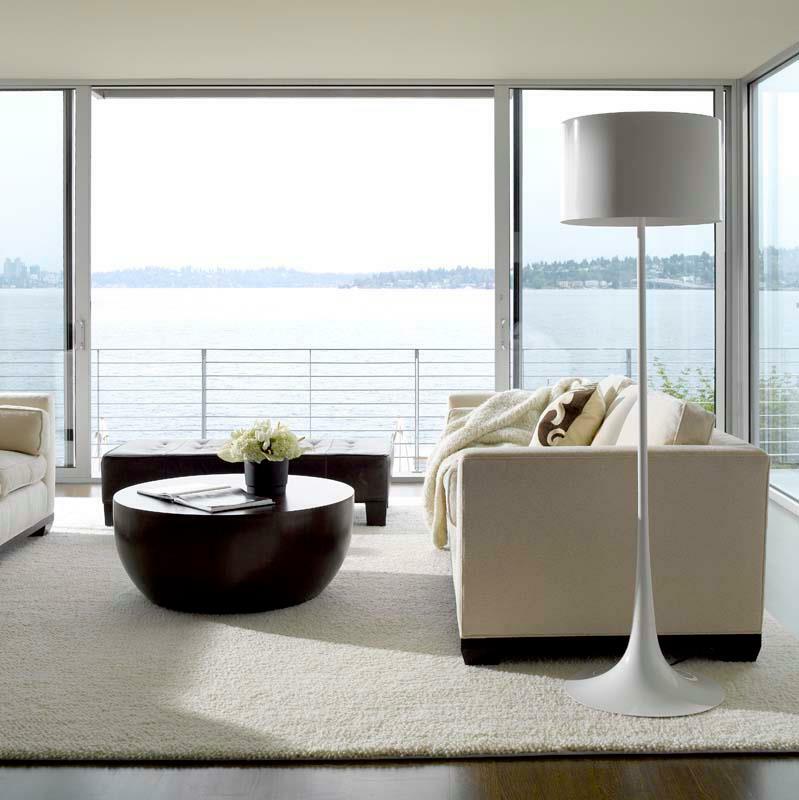 The curvature in the lines of the simple accent chair punctuates the room and rounds out the simplicity. 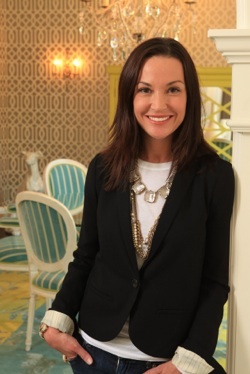 Kara Mann Interior Design. The Eva zeisler coffee table is artwork in itself. White creates a unifying atmosphere. White lets you read the simplicity or the complexity of a space as you will pay more attention to the space instead of surfaces. A muted palette lets you see all the amazing things that you otherwise might have missed. The interior palette of this home allows the water to be the main attraction. Sheer perfection! but the floor? The last great layering frontier has been conquered, thanks to designers willing to think outside the box when it comes to rugs. 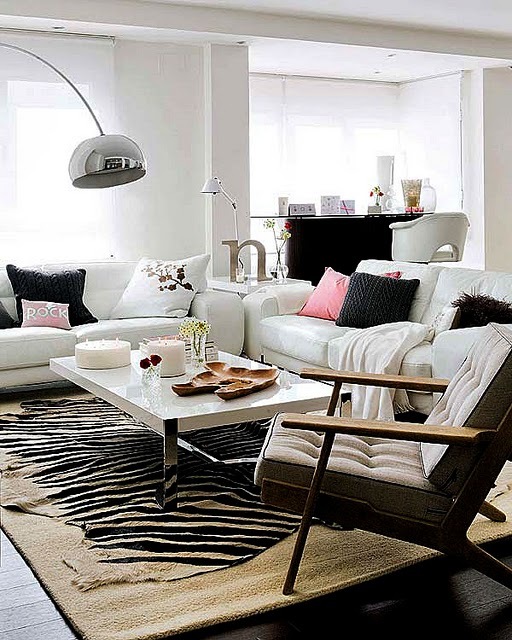 Love the zebra hide over the Moroccan rug! Domino Magazine. I first noticed this layering thing years ago in the now extinct (boo hoo) Nov ’08 issue of Domino Magazine — featuring Jenna lyons (J. crew’s adorable creative director) and her drool-worthy NYC loft. 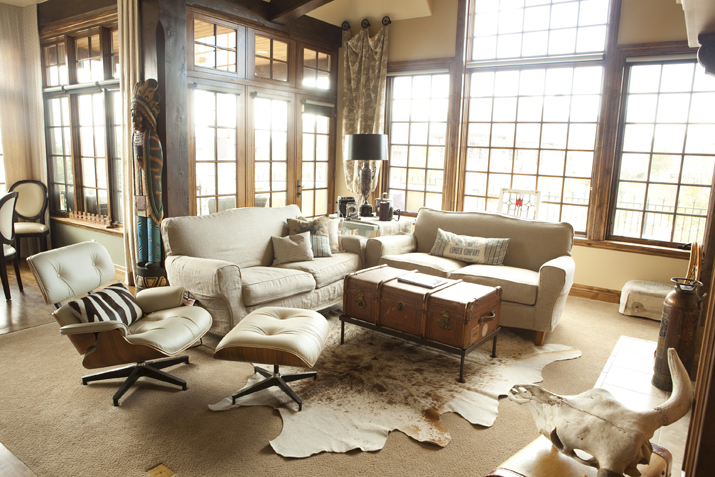 Do you remember seeing this dazzling living room and the zebra hide layered over a vintage moroccan shag? Then I re-discovered the look again while on my semi recent trip to NYC. (From a design perspective I haven’t reported much from that jaunt as the focus was first and foremost to triumphantly conquer ok, more like slog through the world’s greatest marathon) — Nonetheless I had a few additional days, post race, to limp around do what I really love, and visit some of my favorite design shops. One of which, the ever famous ABC carpet and home, where I saw tons of this rug layering … again. Then a painful hobble to NYC’s Safaveigh Rugs, The Rug Co. and the NewYorkDesignCenter solidified this trend as full throttle ahead! limping or no limping, it happened to be beautiful weather on my Rug shopping excursion. Love NYC in Novemeber! Fill in the blanks! 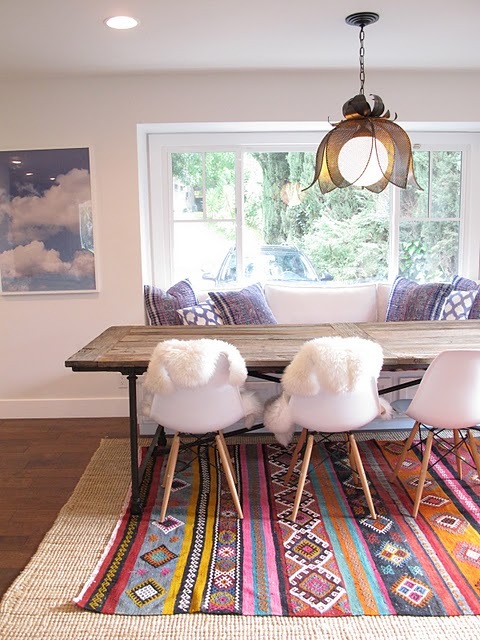 When you seriously love a rug but it doesn't quite cover the area you need it to, it's prime for layering. 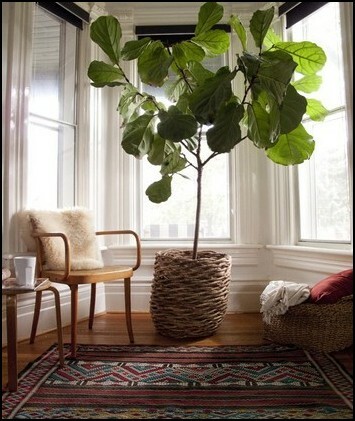 Stick a simple rug underneath in a natural material (jute, rattan or seagrass work well) to cover the difference. Dress up an ordinary (and the sadly overused) seagrass floorcovering. The vibrancy of this rug would be diminished if placed directly on the similarly toned hardwoods. Amber Interior Design. Layering at an angle adds a bit of sass! Although personally I'd have to supress the urge to straighten it. An eclectic look for sure! Decofabulous Blog. wonder who that lukcy "n" is? Traditional interiors can pull off the look as well -- here it was even executed on wall to wall carpeting. As a whole, I’m intrigued by the look. The lush quality, the mixing & matching, the textural interest that results and the definition of space it gives to an entire room . At least for the winter months, could toes be happier? ORANGE IS THE IT COLOR. In 2011 PATNONE’S cheery pinkish color “honeysuckle” was formulated to encourage us to face our everyday troubles with verve and vigor. 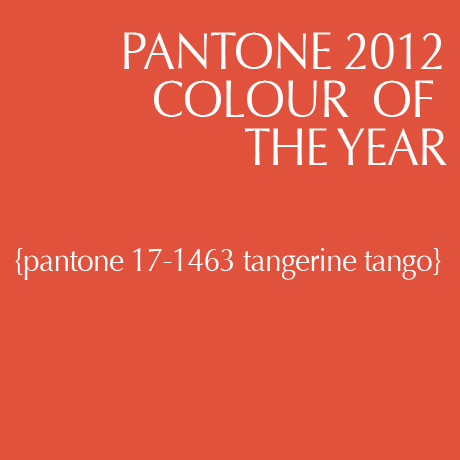 2012’s color of the year PANTONE 17-1463 “tangerine tango” –a spirited reddish orange– continues to provide the energy boost we need to recharge and move forward. Sounds like a large order perhaps, but can’t deny that accessories in this high-impact hue are sure to add spice to any room. EASTERN INFLUENCE. Now that global travel has a major influence on interior design there is new momentum in the melding of Eastern and Western styles and barriers between these cultures has dissolved. As a result, we’re seeing exotic style in accessories , textiles, wall and window treatments, and upholstery. This Pendant light from Plantation home gives off a real middle eastern feel. CONFIDENT COLOR. Large swatches of solid hues are the key to this look. 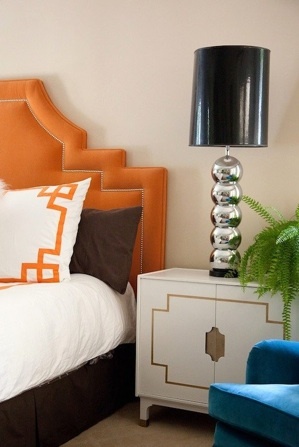 More than “pops” of color provided by pillows and accessories we’re seeing heavily saturated color. 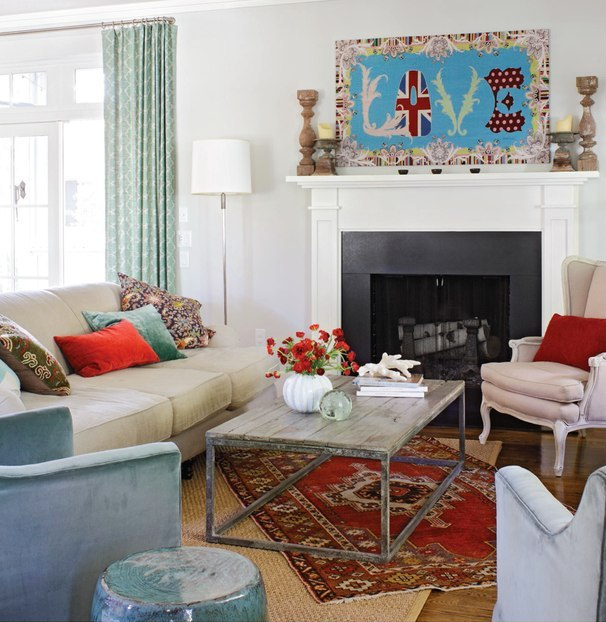 Overdyed rugs are popular and bold solid colored upholstered pieces (I’m loving mohair and velvet). Imagine the room without the imact of the amazing drapes. 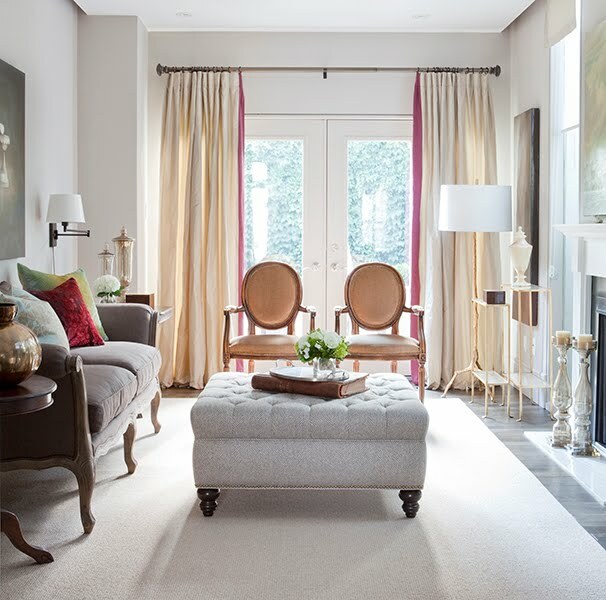 Two bold crimson chairs make a serious statement in an otherwise neutral space. House beautiful. HYPERREALISM. High definition is IN. This genre of exquistily rendered painting and sculpture resembles that of a photograph. Whether your style or not, its certainly an artform worthy of appreciation. Hard to believe this works by Carly Waito is a painting isn't it? WALLPAPER. I installed wallcovering in 13 of my clients homes last year. From grasscloth, to toile, to birds to stripes I don’t see this trend taking a back seat anytime soon. This Asuka wallcovering by Osborne and Little is a favorite of mine. Love the use of grasscloth to de-formalize an otherwise very formal space. This is one of my own designs using Kelly Wearstler Imperial Trellis wallcovering. PLANTS AS ACCESSORIES. Greenery is sprouting up everywhere in stylish homes. 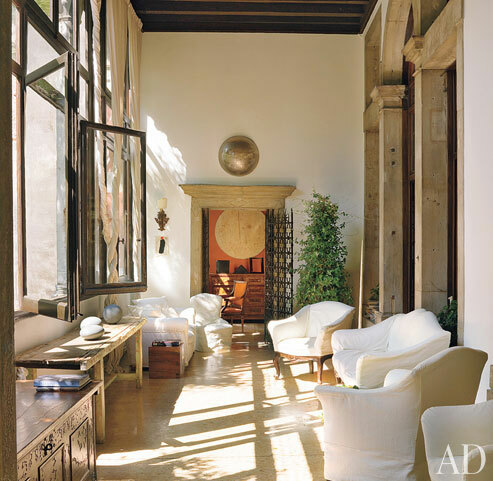 Large leafed trees look sculptural and modern — almost as if an exclaimation point in the room. And smaller desert style shrubs are rearing there heads as unique centerpeices. For us NON proclaimed greenthumbs, stick to tropical plants like succulents and orchids which require minimal watering. bye bye boring terracotta pot. hello gorgeous basket! 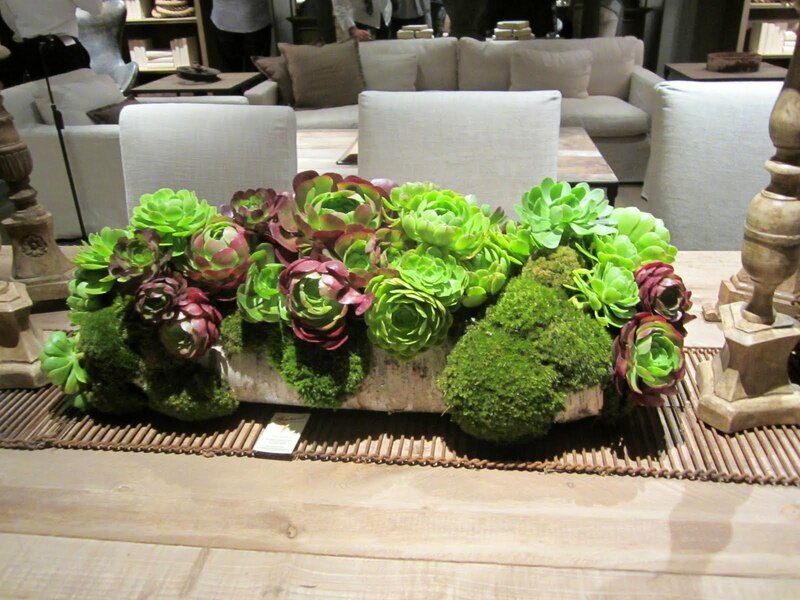 I saw this centerpiece at Restoration Hardware. Birch Bark is the holder. Not sure how to water it, but looks amazing! OVERSIZED LIGHT FIXTURES. Bigger IS better when it comes to light fixtures. We’re talking maximum impact so it’s important to let the fixture itself be the focal point. In the right space it can bring a sense of scale, humor and play. This is by far my favorite trend of the year. 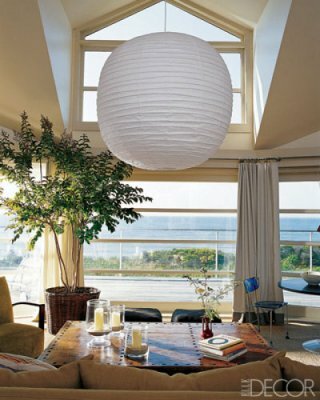 Despite the size of this fixture, the ocean view is not obstructed nor distracts from it. (notice the large plant again too). 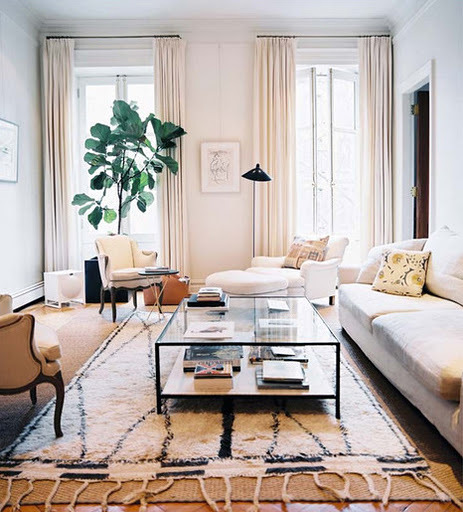 Elle Decor. DWR's "Random Light" was the starting point for this contemporary home I designed. Jacobson Interior Design. What looks more suited as a Dining Room fixture ends up being unexpected eye candy in the kitchen. No need to break the bank! This Maskros Pendant Lamp from IKEA is only $89! SCULPTURAL MIRRORS. Hung above a mantel , over the bed, or in the foyer these mirrors in multifacted shapes allow for a look that’s more dynamic and artistic than the go-to rectangular mirror of yesteryear. No lack of impact here with this mirror available to the trade by Arteriors home. Measuring almost 6 feet wide this mirrored piece by Christopher Guy adds welcomed drama. GLASS ACCENTS. Whether true italian murano, or a marbelized faux this medium is appearing as lamp bases, desk accessories and vases. 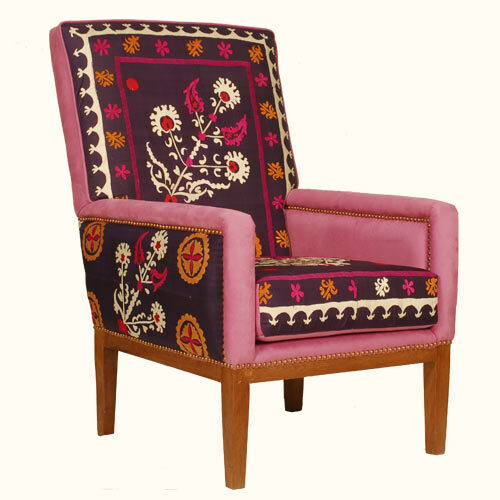 Some of the richly patterned hues can be incredibly showstoppers. Naya Vases from Crate and Barrel are absolutely gorgeous in a lilac color. This Vintage Murano glass lamp from Swank Lighting is artwork in itself. WINDOW COVERINGS. Don’t go naked! Not just for privacy anymore, the decorative value of drapes, fabric valances and woven shades means they are being used in abundance even over traditional wood blinds and shutters. These beautiful woven shades by Conrad warm this otherwise very cool toned kitchen. The addition of the pink edge to the neutral drapes is a cheery idea. Coordinating Window Shades to upholstery commits you to a theme but sometimes worth taking the plunge as seen here! Amanda Nisbet Design. REFINED INDUSTRIAL. In 2012 beauty meets the beast. Though the look is still true to its factory roots, with rough wood and steel elements there is still an unexpected elegance. The pieces below are a case in point. Zinc and wood table by Noir Furniture. Tarnished Steel Sideboard from Ochre. So there you have it! When being a trendsetter having fun is the most important factor! Cheers to decorating in 2012!